This year’s Oscar winner for Best Foreign Language is raw and riveting, and that’s what makes it so effective. “A Separation”, written and directed by Asghar Farhadi is a pileup of horrors, and Farhadi does little to lighten the burden. You won’t find yourself smiling or feeling good after the credits start rolling. Instead, the movie takes you on an emotional roller coaster ride for two hours, and leaves you devastated. I’m not complaining. The movie’s terrific. There are no good guys and bad guys here: only everyday people trying their best to survive. Nader (Peyman Moaadi) and Simin (Leila Hatami) are a couple seeking a divorce. She wants to move abroad with their 11-year-old daughter, Termeh (Sarina Farhadi). He wants Termeh to stay. Keep in mind, this is a society where men make most of the decisions. Which means his wife cannot take his daughter if he doesn’t consent. But Simin is not the best decision maker either: she wants her spouse to abandon his old father, who has Alzheimer’s and can’t take care of himself. In terms of plot, I say that’s all you need to know going in. I am deliberately leaving out details so that you can experience the full impact of the story yourself. The leading character, a great acting performance by Peyman Moaadi , is caught between his responsibility towards his father, and his role as a family man. He knows that the stage is being set for a showdown and it isn’t going to be pretty. Farhadi’s screenplay ties everything together beautifully, injecting it with matters of conscience, coincidence and ethics. He’s an enormous talent. 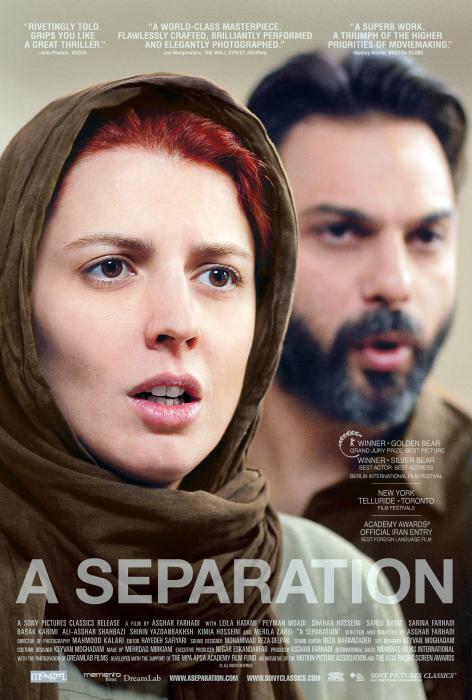 And “A Separation” proves it, even with all the drama overload. Yet with Moaadi and Hatami at the eye of the storm, the movie gets to you. It hits hard. Excellent Movie, and Flawless screenplay. Of the best screenplays since.. I don’t know! I couldn’t take my eyes off the screen! Amazing film. Where did you see it? I’m trying to find it and I’m starting to give up. i downloaded it. But im pretty sure u can find the dvd! what is so compelling about this movie is that it happens daily with everyone of us and we find ourselves dealing with similar situations. Razieh and the things she had to do inorder to avoid her husband’s anger and then at the police station are really an interesting inside look.